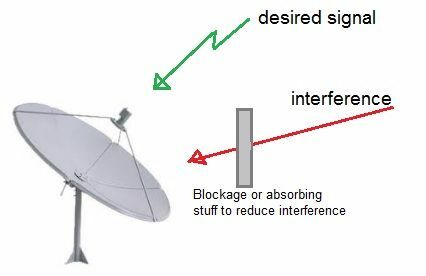 This page describes types of satellite dish interference and mentions techniques to reduce interference to satellite dish antenna. Satellite dish operates usually in C band and Ku band. It receives the broadcast signals transmitted by TV stations and relayed by the various satellites. As the dish antenna is pointing towards sky in order to receive the satellite signals, it is prone to interference. Following are the types of satellite dish interference commonly found. • Weather effects such as snow, ice or heavy to moderate rain. • interference from terrestrial sources such as radar, radio relay stations and other nearby transmitting stations. • Nearby Cellular stations operating in the same band. • Trees in the path of the desired signal over time when they grow up and were not there during the time of installation. Refer RF interference>> which mentions types of interference i.e. ISI, co-channel interference and adjacent channel interference. The figure-1 depicts typical satellite dish antenna. Let us understand how to reduce the interfence caused due to above reasons. As shown, the dish antenna is pointing to the sky and hence will get affected due to line of sight (LOS) interference. This interference is present mainly due to nearby stations operating in the same frequency band. • This interference can be blocked or its effect can be reduced by constructing the wall in the path of interference. • It can also be reduced by using abrobing materials in the line of path of interference or by growing trees in the path. • As the dish antenna is light in weight, it can be move around to avoid any high intensity interference. Moreover its elevation can be changed in order to improve the reception. • Above mentioned steps are fine when the interference type is in band of desired signal's reception. • If the interference is out of band, then it can be removed or filtered out by using appropriate filters before the LNB (Low Noise Block Converter) or LNA (Low Noise Amplifier). • It is recommended to connect the satellite dish with the TV set and keep the TV ON before adjusting the dish above the roof of the house. Adjust the azimuth and elevation of the dish till you get the best picture quality. This is the most used technique in order to have good reception as interference is often time varying in nature.